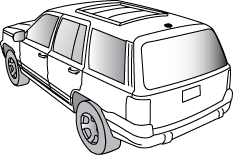 ✓DO: Mount the antenna on the SUV's roof, just above the rear window or front windshield. 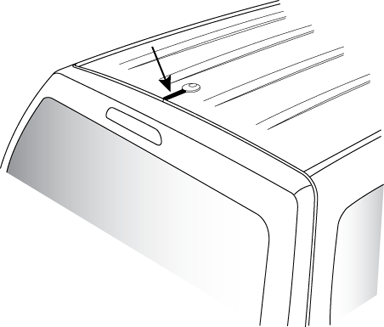 ✓?DO: Use the supplied rubber tail/cover to protect the antenna cable. 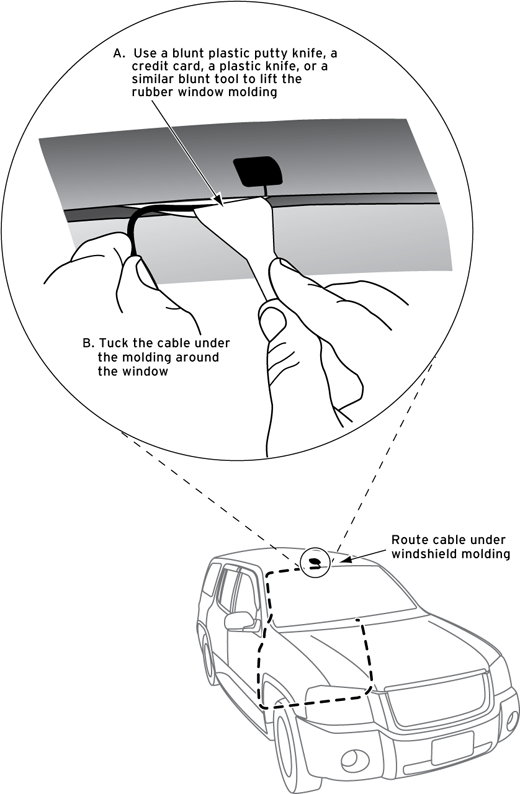 ✓DO NOT: Don't mount the antenna inside the SUV, for example, on the dashboard. 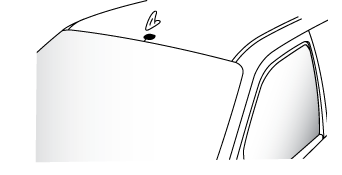 ✓DO NOT: Don't mount the antenna on any of the SUV's front, side or back pillars. ✓DO NOT: Don't mount the antenna close to a roof rack. Adjust the rack so it's further away from the antenna. If the rack isn't adjustable, refer to the section on Pickup Trucks for positioning. ✓DO NOT: Don't mount the antenna closer than 3 inches from the edge of the roof. 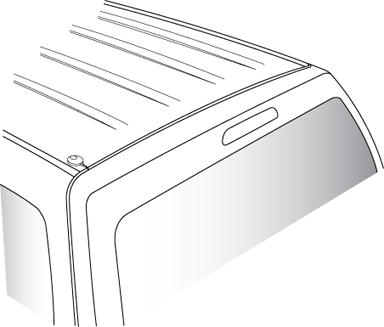 Use the supplied rubber tail/cover as a guide for judging proper length and correct positioning. ✓DO NOT: Don't mount the antenna close to another antenna. Mount it at least 3 inches away. 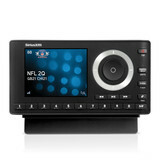 Here's how to route the antenna cable from the SIRIUS Magnetic Mount Antenna to your SIRIUS Radio in an SUV. See the detailed explanations below the main illustration. You can also view the detailed break-out illustrations for each major step by clicking on the link that is highlighted in blue in each section. 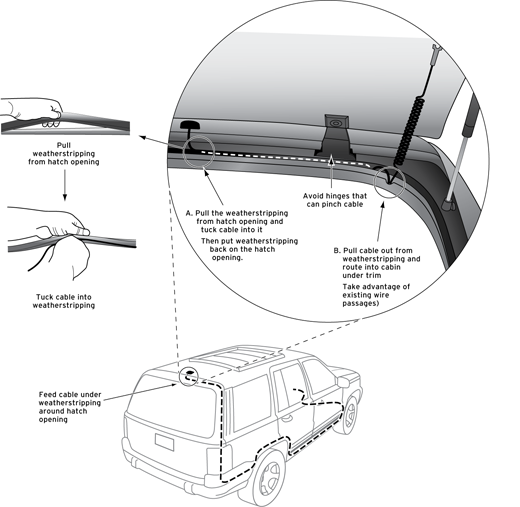 Feed the antenna cable underneath the rubber weather stripping of the rear tailgate window/door and route the cable along the rear hatch. Lift the weather stripping from the opening and tuck the cable inside it. Then replace the weather stripping. 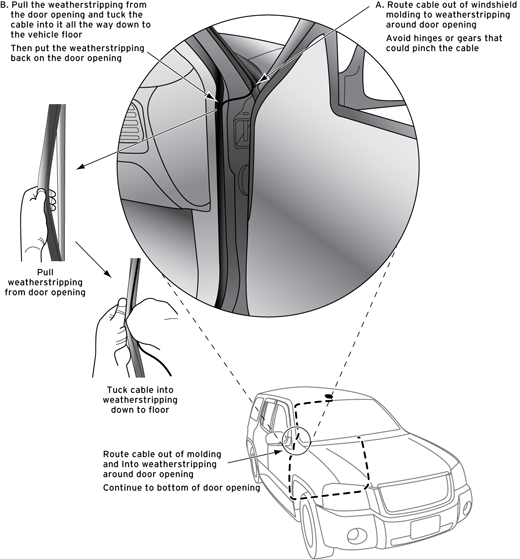 Pull the cable out from weather stripping and route it into the cabin under the interior trim. 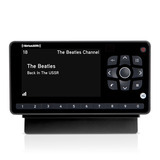 Avoid hinges or gears that could crimp or cut the cable. 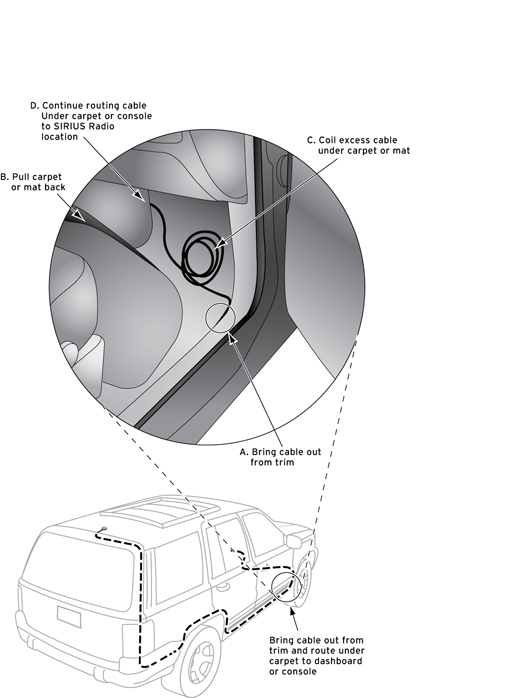 Route the cable through the SUV's main cabin area under the interior trim, towards the front of the vehicle. 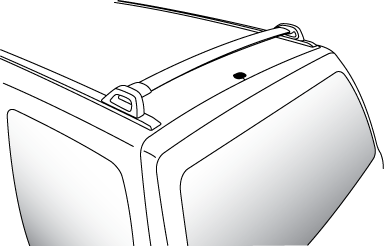 Use a plastic putty knife to lift the plastic trim just enough to tuck the cable underneath. 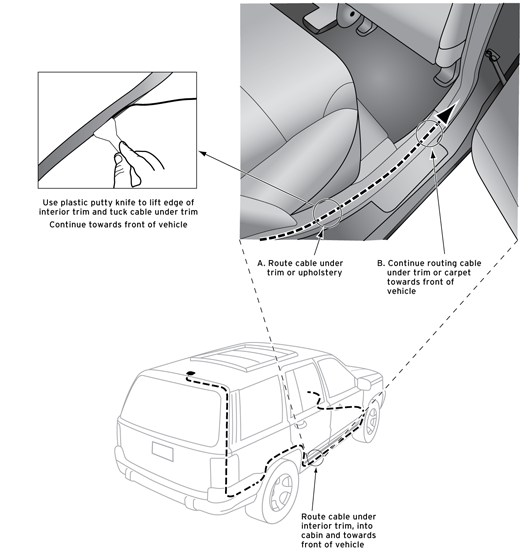 Avoid side airbag locations on back pillars and above the doors. 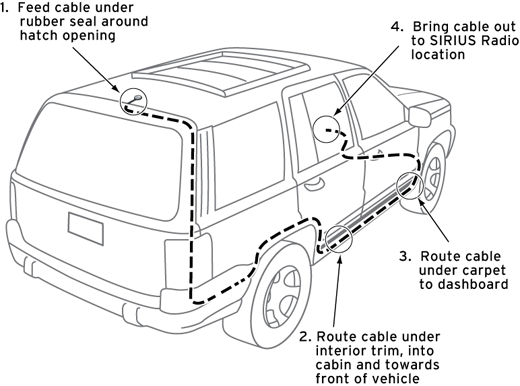 (Airbag locations are marked with "SRS" logos.) Be careful not to crimp or cut the cable. 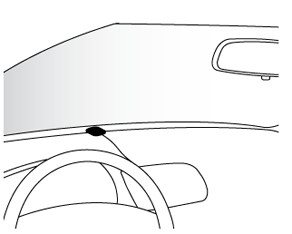 Bring the cable out from the trim near the dashboard and route it under the carpet toward the dashboard or console. 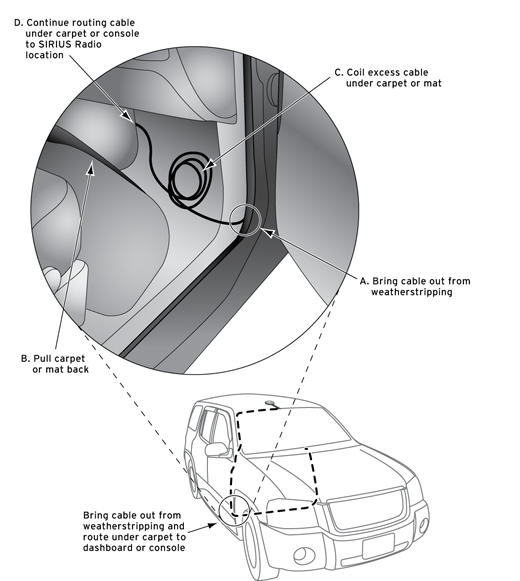 Coil any excess cable in a hidden location, such as under the carpet, keeping it away from any vehicle pedals or controls. Secure the excess cable with wire ties. 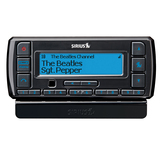 Bring the end of the cable out at the SIRIUS Radio location. 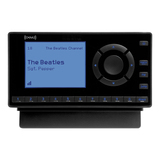 Leave yourself enough cable so you can easily connect it to the antenna connector (sometimes marked ANT) of the SIRIUS Radio or Vehicle Dock. 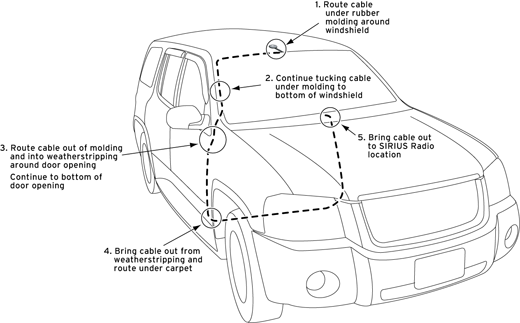 Routing the Antenna Cable From the Front of the Roof Here's how to route the antenna cable from the Magnetic Mount Antenna to your SIRIUS Radio in an SUV. See the detailed explanations below the main illustration. You can also view the detailed break-out illustrations for each major step by clicking on the link that is highlighted in blue in each section.